A.X.L. 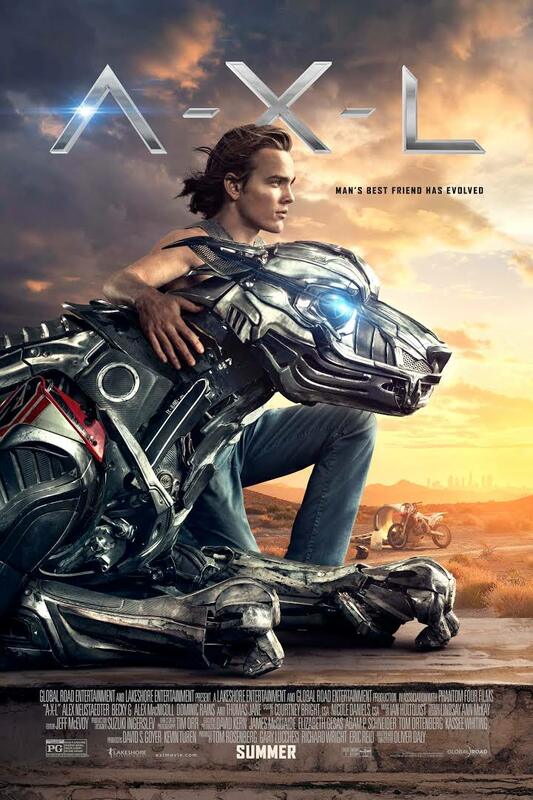 is an exciting but flawed science fiction movie about a hybrid creation known as an A.X.L., which is part dog and part weapon, who befriends a teenage boy. A.X.L. has some good heart, but poor execution with a poor script. There are some positive messages about sacrifice, but it’s mitigated by brief foul language and risqué outfits that warrant caution. A.X.L. is an exciting but flawed science fiction movie about a government experiment to create a fighting robot that’s part-dog and part-warrior, who is befriended by a teenager. The title robot, “Axel,” is the prototype of an artificial intelligence robot called an A.X.L., which stands for “Attack, Exploration and Logistics.” The new robot is as loyal as a dog, but as deadly as an M-16. Teenage dirt-bike racer Miles Hill (Alex Heustaedter) befriends “Axel,” who defends him from bullies and helps Miles pursue his love interest, Sara, played by pop singer Becky G. Miles. “Axel” grows emotionally attached to his new owners, but is A.X.L. a robot or something more? The movie begins with A.X.L. breaking out of the lab where he was created. He’s discovered by Miles Hill, a good-hearted but struggling dirt bike racer. Hill’s racetrack rival, Sam Fontaine (Alex MacNicoll), bullies him, leaves him injured and moves in on Hill’s girl, Sara, who happens to live on the Fontaine estate. The Fontaines treat Sara’s Hispanic family like their personal property. Meanwhile the scientists, who can still monitor Axel’s internal circuitry, see that human companionship has made him “more sophisticated” and more emotional than they ever expected. Now, they must retrieve him before the military pulls its $70 million budget, or Axel kills Sam and his gang of MX Bike hooligans. A.X.L. has its heart in the right place with generally good themes and execution. However, a weak script makes it jump the shark more often than Miles jumps dirt hills on the racetrack. The biking and fight scenes hold the audience’s attention without resorting to gore. Meanwhile, Writer/Director Oliver Daly’s penchant for changing camera perspective from one character to another helps keep the audience’s attention, especially during lulls. The soundtrack dramatically improves nearly every scene. Regrettably, every time the movie hits its stride, forced “humor” or poor dialogue destroys the mood. At one point, A.X.L. spurs young lovers to dance by playing 1970s music and projecting a light show from his own side. Just before a character makes a major act of self-sacrifice for the sake of another, he inexplicably repeats the movie’s most banal phrase, leaving viewers laughing at the movie seconds before they should be crying at the character’s noble choice. Most of the time, the movie works, but just barely. The audience really cares about the robot-dog hybrid and roots for Miles and Sara. That said, A.X.L. would have worked better as a science fiction movie aimed at children, who are a bit young for the movie’s brief obscenities and profanities, and a few shots at Becky G’s cut-offs and bikini top. The movie does raise interesting moral and philosophical questions. If artificial intelligence takes on almost human emotions, do we still think of the creations as robots? Are they more or less intelligent, and worthy of humane treatment, than animals? This isn’t too different from the questions that JURRASSIC WORLD: FALLEN KINGDOM asked. The movie has a generally positive, moral, redemptive worldview that emphasizes giving up your life for others, but it also presents theft as morally acceptable. When Axel hacks a gas pump and ATM machine, Miles says, “It’s good.” In addition, every family is dysfunctional or broken, with poor parental portrayals. The violence, brief foul language, risqué wardrobe of Sara in a few scenes, and other negative content warrant caution for older children. Miles and Sara kiss twice and romp around, fully clothed, on the beach. In a party scene, teenagers are shown drinking an unidentified beverage from red plastic cups, and throwing unidentified cans to one another, character uses the terms “turnt” and “lit”. A.X.L. is an exciting but flawed science fiction movie about a government experiment aimed at creating a fighting robot that’s part dog and part warrior. A.X.L. (“Attack, Exploration, and Logistics”) is an artificial intelligence robot trained to be “the ultimate war dog,” a deadly weapon as loyal as a dog but as deadly as an M-16. Teenage dirt-bike racer Miles Hill befriends “Axel,” who defends Miles and his girlfriend from bullies. At what point does a robot develop feelings and become something more than a robot? Also, when the bullies, desperate scientists and the U.S. military are hot on their trail, can they survive the chase? A.X.L. features thrilling race scenes and fights punctuated by non-gory action, but a poor script with some terribly cheesy scenes and dialogue. Most of the time, the movie works, but just barely. There is a positive theme of Gospel-like self-sacrifice. The movie also raises interesting moral and philosophical questions about artificial intelligence and the nature of humanity. However, A.X.L. is mitigated by brief foul language, a few risqué outfits and other questionable moral elements that warrant caution.